Flats happen. If you feel and hear that fateful pop, don’t panic. Even if you’re on the go and already running late to work, we’ve got you covered. Check out our guide to fixing your flats and getting back on your merry way with lickity-split timing. We’ve all heard the adage – luck is when opportunity meets preparation. When it’s your lucky day to fix a tire, be prepared. Here is what you should always have with you on a ride to fix a flat. If you don’t have the items below, be sure you at least have your cell phone (with a full charge), some cash and/ or a credit card for a taxi. That way you at least can call or pick up a ride home. 1. Stop! Pull over to a safe place on the side of the road or trail. Remove your saddle bag and cycling computer, if you have them. 2. Shift! If you have a rear flat, shift into the smallest ring on your cassette. This will make the chain loose and will ensure your wheel is easy to remove and reinstall. If you have rim brakes, spread your brake pads by removing the cable tension or flipping the lever. In this video (and in real life), we flip our bikes upside down. It makes the bike stable and easy to remove and reinstall your wheels. If you're worried about scrapes or scuffs on your handlebar tape and saddle, find a grassy area or ride with a rag in your jersey pocket. If you ride a mountain bike with hydraulic disc brakes, you might be worried about air finding its way into your brake lines. Usually, this is only an issue if you store your bike upside down for long periods of time. 3. Remove the wheel from the bike. Remember, each bike can be different. We recommend practicing removing both your front and rear wheel from your bike so you are prepared when you get a flat. Generally speaking, the rear is always the wheel that gives you trouble. If you make sure you shift into the smallest ring on the cassette, it should make this easier. Then, remove the axle (MTB) or loosen the quick release (but don't remove the nut! ), pull the derailleur back and out of the way, and pull your wheel straight up and out of the dropouts. 4. Wiggle the tire back and forth, loosening the bead from the rim. Working the tire into the center of the rim will make it easier to remove the tire. Also, make sure all the air is out of the tire by pressing on the end of the valve (Presta) or using a small object to push the pin inside the valve (Schrader). 5. Using the "spoon"-shaped end of the tire lever, pull the tire bead up and away from the wheel rim. Use the hook at the end of the lever and hook it to the spoke of the wheel. 6. Using the second tire lever, insert the "scoop" end under the bead of the tire near the first tire lever you inserted. Pushing forward, remove one side of the tire completely from the rim. 7. This will make it so you can easily access the inner tube. Pull the tube out of the tire. 8. Inspect the outside of the tire for holes and tears. Carefully run your fingers along the inside of the tire to check for sharp objects. Remove anything that could cause a second flat! 9. Inflate the new tube slightly to make it easier to put into the tire. You can do this with a hand pump or your mouth! Simply unscrew the end of the Presta valve on the tube, push the end to allow air to flow into the tube and... blow! 10. With one side of the tire on the rim, insert the valve of the new inner tube into the rim. Place the tube inside the tire. Then, working your way down with both hands from the valve, insert the bead of the tire into the rim. 11. When you have most of the tire inserted into the rim, the last bit can sometimes be a bit of a pain. PRO TIP: If the last bit is super tight, start back at the top and use your hands to wiggle the tire into the center of the rim. Just like you did at the beginning to loosen the bead from the rim, this creates extra slack in the tire and will make it easier to get onto the rim. While you wiggle the tire push down. When you get to the bottom, you might be able to pop that tire on with your bare hands! 12. If the tire is still a bit tight, grab your tire levers again and flip it over to push the tire back onto the rim. Before you air up, it is a good idea to pull back the edge of the tire to ensure none of the inner tube is stuck under the bead. PRO TIP: Careful! When you use a tire lever it is possible to puncture your brand new tube! Insert your tire lever under the edge of the portion of tire that is tight. Once there, you should be able to feel the edge of the rim with the "scoop" on the lever. Move the lever back and forth along the edge of the rim. If your lever glides easily, you are good to go! If the tire lever feels like it is stuck or sticking to the rim, your lever is on the tube. Remove the lever and push the tube further inside the tire with your fingers. Whew! You just saved your brand new tube! 13. Using the inflation device of your choice, put air back in the tube. 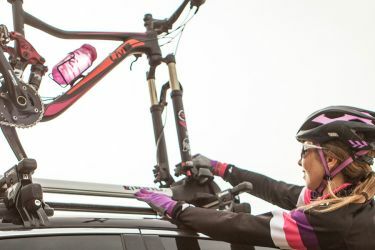 We suggest trying out your CO2 before using it out on the road or trail. Sometimes those valves can be tricky and it is much better to waste a CO2 at home than waste it when you really need it. 15. Reinstall your wheel. If you got a front flat, that is pretty easy. If you are fixing a rear flat, this is usually where people get caught up. No need to worry! Just remember, you already shifted into the smallest ring on your cassette, so that's where your chain should go. Also, remember that your cassette goes between the chains. Then, just move your derailleur back out of the way so your wheel can settle into the rear dropouts. Replace the axle/ tighten your quick release skewer and you're good to go! 16. If you have rim brakes, don't forget to tighten the cable back down once your wheel is in. Then, just give it a spin and squeeze your brake to make sure everything works like it should. Nice job!